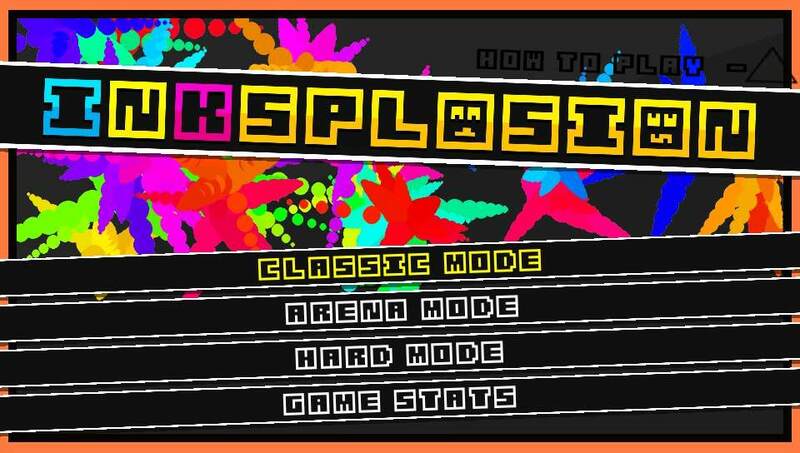 Inksplosion is a fairly standard top-down twin-stick shooter from Petite Games, the creators of the Midnight series of video games. 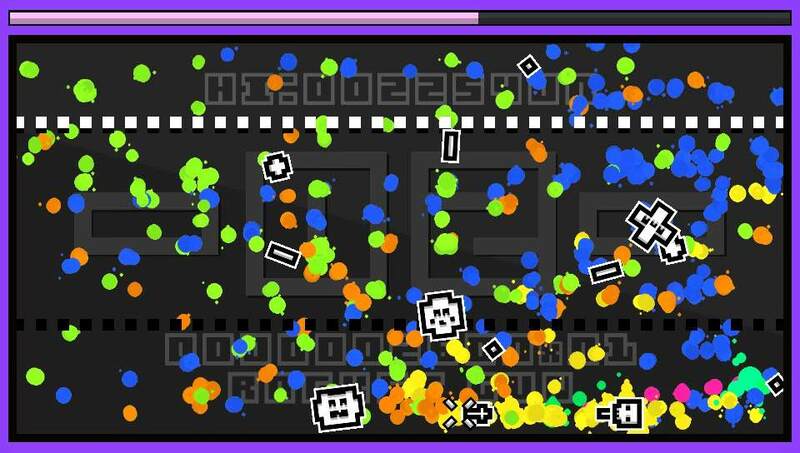 In Inksplosion you play as a skull that can shoot a plethora of different gun types in order to survive hordes of incoming enemies while aiming for the high score. The Classic Mode is the first mode you get access to and it’s quite frankly the most engaging of all three modes available in the game. In this mode you have to clear randomly generated stages with a given gun, be it the slow yet powerful rocket launcher, the standard Normal Gun or the ol’ reliable shotgun with its spread shot. Surviving these stages isn’t a big deal for the most part as enemy waves are incredibly small and they don’t take a whole lot of damage to be destroyed. You do have to pay attention to your health gauge as it can be depleted quite fast in later stages and dying means having to start from the very beginning of the game. The gameplay can get fairly hectic because of how the stage gets covered in ink from your bullets and from oncoming fire from every single enemy. This visual detail is far from original but it works well in a top-down shooter like Inksplosion. Over in the sound department, there are a couple of nice tracks by Levi Bond. Once you get good at Classic Mode you’ll unlock another mode which is the Arena which works like a Survival Mode but barely adds anything to the main game mode. Besides this there’s also a harder version of Classic Mode but, again, it doesn’t do much to differentiate itself from the primary game mode. Old school arcade games like this relied on high score chasing and that can be a goal in itself as well in Inksplosion but these will only keep your interest for a little while due to the lack of variety in general. 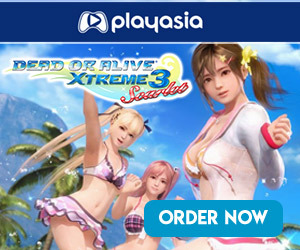 Trophy hunters will rejoice however as Inksplosion is a cross-buy game and features separate trophy lists which include a platinum, meaning that you can get two (one of PS Vita and one on PS4) in about 20 minutes. 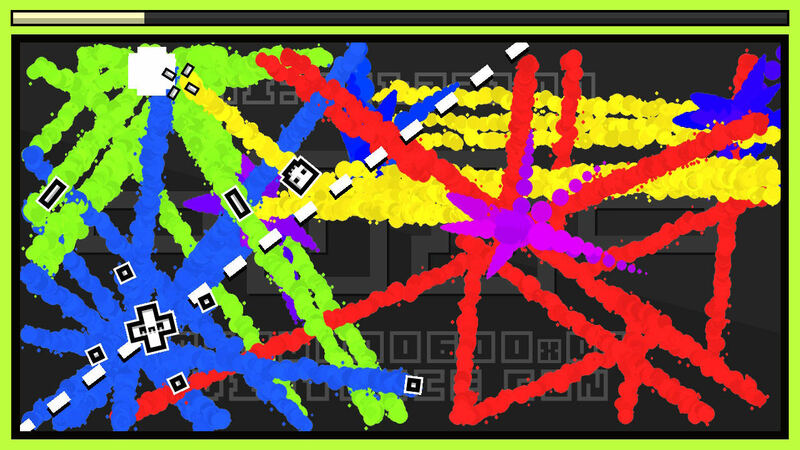 Inksplosion is an OK top-down shooter for anyone looking for a cheaper alternative to some of the more expensive and meatier games in this genre but the lack of modes and gameplay variety really hurt the game in the long run.